Even if you can’t adopt a cat this month, you can make a difference in a shelter cat’s life. 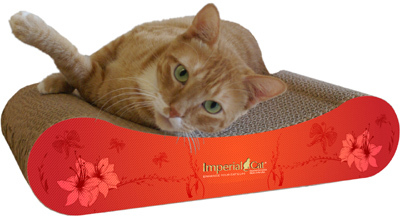 Imperial Cat offers Scratch ‘n Bits, an affordable line of recycled scratchers created just for shelter cats! Scratch ‘n Bits are made in the United States from 100% post-consumer recycled materials, and may be recycled after they’ve been lovingly scratched to pieces. 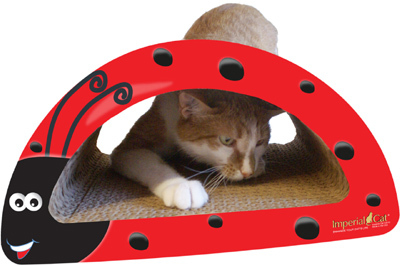 Scratchers can help sheltered felines relieve stress and feel more at home. Also, once cats are adopted, the scratchers can go home with them, helping to ease the transition and discourage scratching of furniture, the leading cause of relinquishing household cats. You can donate a case of 20 Scratch ‘n Bits to the shelter of your choice for $25. Yes, that price includes shipping costs. To donate Scratch ‘n Bits for your shelter, call 1-800-783-0977 and ask for Kristie or get more details online at catclaws.com/adoptacat/. 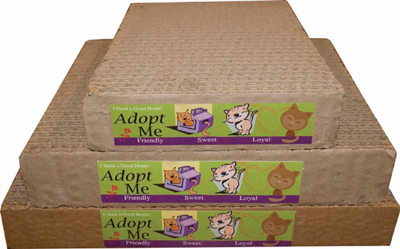 Need a cute recycled scratcher for your kitty at home? Check out Scratch ‘n Shapes from Imperial Cat. These aren’t your ordinary cardboard scratchy things. Scratch ‘n Shapes come in 80 different shapes. They’re also 100% recycled and include certified organic catnip. Have you used a Scratch ‘n Shapes? My kitties, Lloyd and Samsonite have an Imperial Cat Scratch ‘n Shape and they love it. I think they like it most so they can play king of the scratcher, haha.